CONVERGENCE winds up 134% funded, releases TEST SCENE Teaser! At midnight Pacific Time last Friday (while I was on East Coast time in Atlanta…don’t worry, folks, Axacon coverage is coming later this week! ), the 5-way crossover fan film CONVERGENCE finished up its Indiegogo campaign with $7,385 from 114 backers! This was a third over their posted goal of $5,500, and allowed them to surpass two stretch goals. The first (at $6,000) would cover the Indiegogo fees and perk production costs, meaning that all $5,500 could go to the production itself. The second stretch goal ($7,000) will fund both a new late TNG/DS9 era uniform for actor Jim Von Dolteren (of a quality to match the others) as well as a special behind-the-scenes bonus video with interviews, bloopers, and “making of” features. Even though Indiegogo offers the “In Demand” status for any campaign that exceeds its goal (meaning, you can continue raising money even after your campaign “ends”), sh0w-runner and Hobbit ring-bearer (to bring them all, get it?) SAMUEL COCKINGS has decided that he’s now got enough to make this happen. So the campaign is now officially closed. As you might remember, Samuel was contacted by a concerned CBS when they saw the trailer to his other upcoming Trek fan film TEMPORAL ANOMALY. And even though discussions with CBS were cordial, and Samuel reached an agreement when Temporal Anomaly could be released with some changes and is now allowed to exceed the 30-minute runtime limit, Samuel prefers not to poke the bear when it comes to the Trek copyright holders. He set out to raise $5,500. He did so, got a little extra to improve the finished project, and now he doesn’t need to keep taking in more money. On the final day of the campaign, Samuel released a sneak-peek “test scene teaser” showing what Convergence will look like when finished. Well…kinda. Y’see, it’s a TEST scene, and it still needs quite a bit of work. Samuel says it’s got the wrong LCARS, it’s missing a Master Systems Display, a dedication plaque, and possibly some extra crew members in the background. The sound and music aren’t finalized yet either. “It’s a work-in-progress (WIP),” Samuel told me with the enthusiasm of someone tackling a challenging project that he’s really excited about. And I’m also excited! Author Jonathan LanePosted on November 5, 2018 Categories Crowd-Funding Blogs, Fan Film Features, NewsTags Batavia, Chris Burdett, Convergence, Dark Armada, Intrepid, Jim Von Dolteren, Nick Cook, Nimran Saund, Robin Hiert, Samuel Cockings, Star Trek: Renegades, Starship Republic, Temporal Anomaly4 Comments on CONVERGENCE winds up 1344 funded, releases TEST SCENE Teaser! LAST CHANCE to donate to CONVERGENCE (new “4th wall” video available)! The Indiegogo campaign for the multi-crossover fan production CONVERGENCE ends in less than two days! Convergence unites actors and elements from FIVE different fan films and series—Intrepid, Dark Armada, Starship Republic, Renegades, and the soon-t0-be-released Temporal Anomaly—under the direction of fan CGI wunderkind SAMUEL COCKINGS. The campaign has already met its primary goal of $5,500 and currently sits at $6,040. But if Samuel can reach $6,400, he’ll be able to afford an improved late-DS9/TNG movie-era uniform…or possibly even something a little more, shall we say, futuristic (since one of the characters will be traveling back from the future). I’m pretty sure he can make that goal before things close up. So once this campaign is over, it’s over—and the perks will no longer be available. If you want any of ’em, donate NOW! There are also currently some exciting stretch goals. At $7,000 (certainly within reach!) fans will get to see special behind-the-scenes features: bloopers, interviews, making-of documentary, etc. $8,000 will see the addition of a NEW SCENE in the corridor (which requires a new virtual CGI “set” be created), available as a special direct-to-donors extended cut. $9,000 funds a second exclusive NEW SCENE, this one in Engineering. And $10,000 will allow Samuel to create a new shuttle design rather than using the existing Type 11 shuttlecraft we’ve all seen before. Click here to donate to Convergence. CONVERGENCE releases one of the BEST crowd-funding videos I’ve ever seen! Samuel has saved the best videos for last. Already, there was a fun interview on Wednesday with NICK COOK, who will be reprising his role of Captain Daniel Hunter of the fan series Star Trek: Intrepid. And on Friday, Samuel posted another interview with actor CHRIS BURDETT from the upcoming fan film Temporal Anomaly. Both of these gentlemen will be starring in Convergence. While both of those interviews were very well-produced (good lighting, good sound, interesting questions and answers) and are certainly worth viewing if you’re a fan of fan films, it was the video Samuel released this morning that blew me away. This 3-minute vignette is now my second favorite crowd-funding “ask” video ever. Why is it my second favorite? Well, nothing will likely ever surpass this video (and the four that came after it) from Star Trek Continues‘ “Kirkstarter 2.0.” But the reason this Convergence video gets the secondprise (get it? ), is because it has so much fun while asking folks to donate. Begging for money is never easy, and fan films who go the crowd-funding route have taken various approaches from serious to whacky. Sometimes it’s easy because they have big celebrities or they’ve already filmed or released other work to show what they can do. But sometimes, you’ve just gotta work with what you have. For anyone planning a crowd-funder, bookmark this video and the others in Samuel’s series. And speaking of which, our Mr. Cockings promises another two interviews over the next two days, followed by what he calls a “4th wall-breaking viral video” on Tuesday and the first full teaser with actual footage on Wednesday. The campaign ends Friday. Author Jonathan LanePosted on October 27, 2018 Categories Crowd-Funding Blogs, Fan Film Features, NewsTags Batavia, Chris Burdett, Convergence, Dark Armada, Intrepid, Jim Von Dolteren, Nick Cook, Nimran Saund, Robin Hiert, Samuel Cockings, Star Trek: Renegades, Starship Republic, Temporal Anomaly1 Comment on CONVERGENCE releases one of the BEST crowd-funding videos I’ve ever seen! Welcome to CONVERGENCE…a fan production uniting FIVE accomplished fan films and series from FOUR different countries into ONE amazing crossover event! And YOU can help make it all possible. 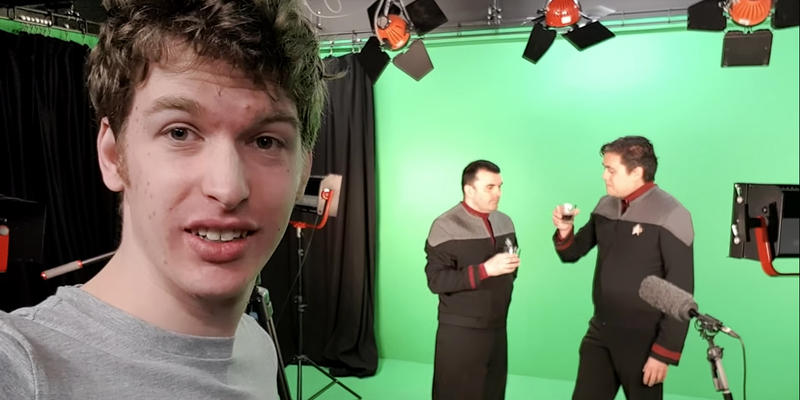 These folks have already completed one video shoot with four of their five primary actors: NICK COOK from Star Trek: Intrepid (Scotland), ROBIN HIERT from Star Trek: Dark Armada (The Netherlands), and CHRIS BURDETT and NIMRAN SAUND from the upcoming Temporal Anomaly (Great Britain). They also have a number of jaw-dropping VFX created by SAMUEL COCKINGS, life-long Star Trek fan and co-host/co-creator of the popular webseries “Trekyards.” Some of this CGI will include the Archer-class starship from the original Star Trek: Renegades, as well as the villains from that fan film, the Syphon. Their project is already well underway. But now they need $5,500 to complete it, and they’ve just launched a new Indiegogo campaign. Fan donations will allow Samuel to fly in his full cast for a second studio green screen shoot to get the rest of their scenes filmed with proper lighting, sound, and staging. This will include their final main actor, JIM VON DOLTEREN from Starship Republic, who will be flying to the U.K. from America, along with the others.